This update incorporates a new release of ICOADS R3.0, a decade of near-surface data from Argo floats, and a new estimate of centennial sea-ice from HadISST2. A number of choices in aspects of quality control, bias adjustment and interpolation have been substantively revised. The resulting ERSST estimates have more realistic spatio-temporal variations, better representation of high latitude SSTs, and ship SST biases are now calculated relative to more accurate buoy measurements, while the global long-term trend remains about the same. A lot of people have asked about including ARGO data, but it may be less significant than it seems. ARGO floats only come to the surface once every ten days, while the more numerous drifter buoys are returning data all the time. There was a clamor for the biases to be calculated relative to the more accurate buoys, but as I frequently argued, as a matter of simple arithmetic it makes absolutely no difference to the anomaly result. And sure enough, they report that it just reduces all readings by 0.077°C. That can't affect trends, spatial patterns etc. Furthermore, high latitude SSTs are decreased by 0.1°–0.2°C by using sea-ice concentration from HadISST2 over HadISST1. Changes arising from remaining innovations are mostly important at small space and time scales, primarily having an impact where and when input observations are sparse. Cross-validations and verifications with independent modern observations show that the updates incorporated in ERSSTv5 have improved the representation of spatial variability over the global oceans, the magnitude of El Niño and La Niña events, and the decadal nature of SST changes over 1930s–40s when observation instruments changed rapidly. Both long (1900–2015) and short (2000–2015) term SST trends in ERSSTv5 remain significant as in ERSSTv4. There are no obvious systematic trend differences. The most noticeable change is around WWII, which is a bit of a black spot for SST data. A marked and often suspected peak around 1944 has diminished, with a deeper dip around 1942. Almost identical behaviour is seen with TempLS grid. Down from 0.83°C in May to 0.82C in June (report here). I don't normally post separately about NOAA, but here I think the striking difference from GISS/TempLS mesh is significant. GISS went down 0.19°C, and TempLS mesh by 0.12°C. But TempLS grid actually rose, very slightly. I have often noted the close correspondence between NOAA and TempLS grid (and the looser one between TempLS mesh and GISS) and attributed the difference to GISS etc better coverage of the poles. you see that the total dropped by about 0.12°C, while Antarctica dropped from conributing 0.07C to -0.07C, a difference that slightly exceeded the global total drop of 0.12C. That doesn't mean that, but for Antarctica, there would have been no cooling. May had been held up by the relative Antarctic warmth. But it is a further illustration of the difference between the interpolative procedures of GISS and TempLS and the cruder grid-based processes of NOAA and TempLS grid. I would probably have abandoned TempLS grid, or at least replaced it with a more interpolative version (post coming soon), if it were not for the correspondence with NOAA and HADCRUT. Update: I see that the paper for ERSST V5 has just been published in J Climate. I'll post about that very soon, and also, maybe separately, give an analysis of its effect in TempLS. I see also that NOAA was still using V4 for June; I assume they will use V5 for July, as I expect I will. The NOAA ERSST V5 page is here. Here is the NOAA map for the month. You can see how the poles are missing. 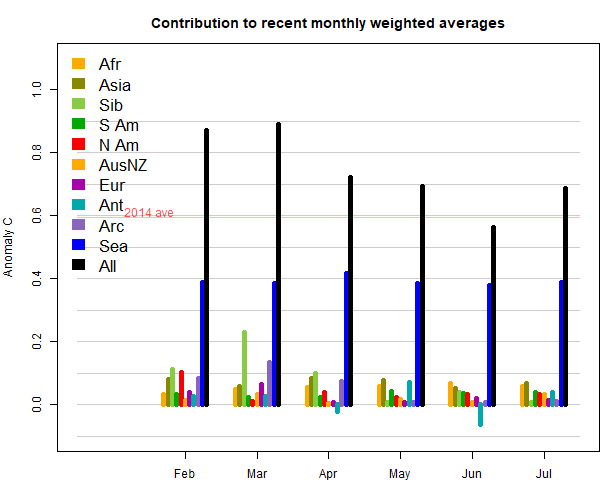 GISS June down 0.19°C from May. 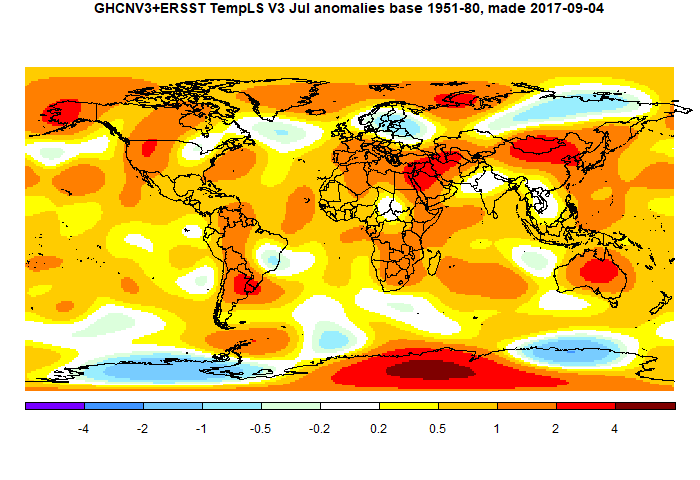 GISS was down from 0.88°C in May to 0.69°C in June.The GISS report is here; they say it was the fourth warmest June on record. The drop was somewhat more than the 0.12°C in TempLS. The most recent month that was cooler than that was November 2014. The overall pattern was similar to that in TempLS. The big feature was cold in Antarctica, to which both GISS and TempLS msh are sensitive, more so than HADCRUT or NOAA. Otherwise, as with TempLS, it was warm in Europe, extending through Africa and the Middle East, and also through the Americas. Apart from Antarctica, the main cold spot was NW Russia. So far, July is also cold, although with some signs of warming a little from June. As usual, I will compare the GISS and previous TempLS plots below the jump. TempLS mesh was down from 0.704°C in May to 0.586°C in June. This follows the slightly larger fall of 0.16°C in the NCEP/NCAR index, and falls in the satellite indices, which had risen in May. The June anomaly (1961-90 base) is now a little below mid-2015 values, and is the coolest month since Nov 2014. In fact, it is similar to the 2014 annual average, which was still a record in its day. I quoted from the abstract in my previous post. Now you can see what has happened. 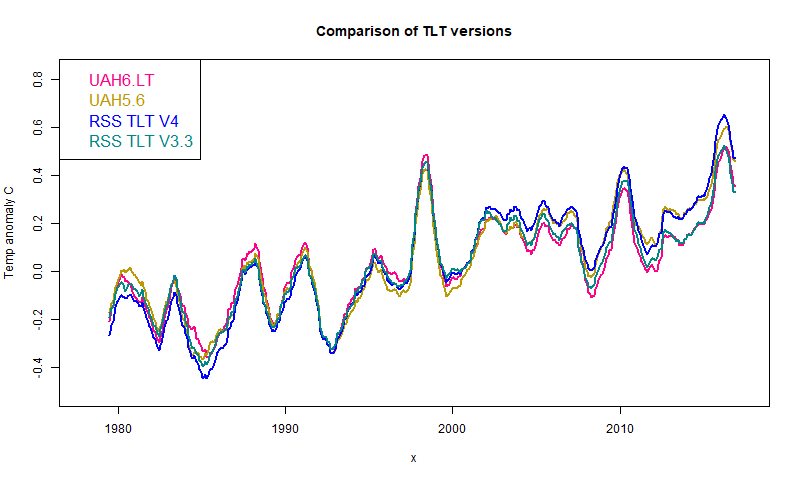 RSS TLT V4 is close to UAH V5.6, and UAH V6 is close to the old RSS V3.3 (which RSS described as having a known cooling bias). As they noted, the new RSS V4 shows more uniformity over time. 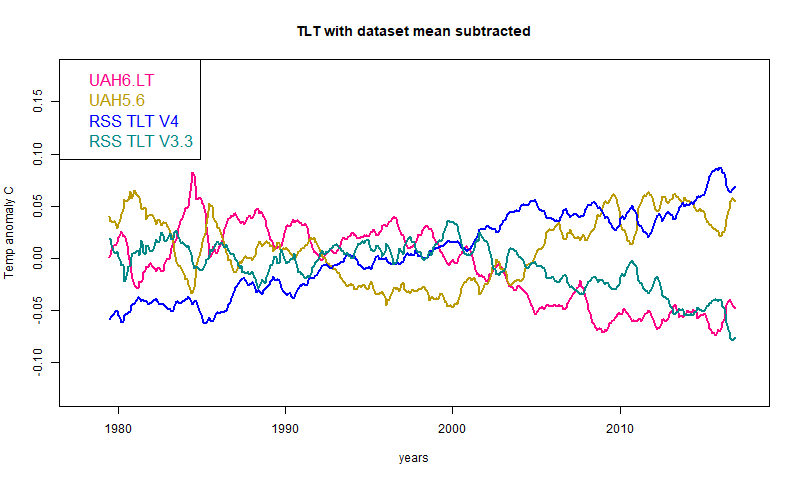 The overall picture is that TLT measures are not stable; much less so than surface measures, as I noted here. 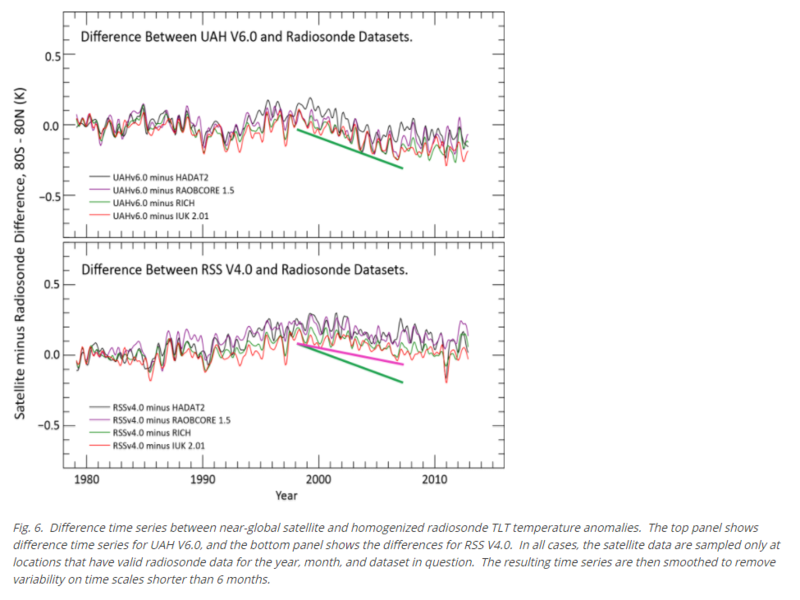 Contrary to some (mainly sceptic) opinion, satellite measures are not naturally superior. Measuring the temperature at various levels of the troposphere is a worthwhile endeavour, but it is not a substitute for surface. In fact, I think TLT has had undeserved prominence, and I rather thought RSS should drop it altogether. It is an attempt to get as close to surface as possible, but it isn't very close, and sacrifices much reliability in trying to get there. I notice the John Christy now usually quotes UAH TMT. The reason for loss of reliability is that the MSU is trying to make deductions from a microwave signal which is a mix of various layers in the troposphere, with a large background noise generated at the surface. It is hard to discriminate, and harder as you try to see closer to the surface. They try to get around this by taking two measures designed for higher levels (TMT and, for UAH, a tropopause level TP), and forming a linear combination which is designed to subtract out the higher troposphere and stratosphere levels. But as with any such differencing, errors increase. There is only one instrument, or at most a few, while at the surface there are thousands, creating lots of redundancy. One consequence is that with satellites there is a big problem with the inevitable changeovers. Surface stations needd some adjustment when the instruments or environments change but that is minor compared with changing the whole instrument base every few years. The instrument doesn't read a thermometer at every level. It has to resolve a mixed incoming microwave beam, confounded with surface noise. You can get some resolution with frequency bands, and a little more with differing angles of view. But it is really squinting, and in the end you have to solve an inverse problem, which takes adventurous mathematics. For example, years ago we could use certain AMSU-carrying satellites which minimized the effect of diurnal drift, which we did not explicitly correct for. That is no longer possible, and an explicit correction for diurnal drift is now necessary. The correction for diurnal drift is difficult to do well, and we have been committed to it being empirically–based, partly to provide an alternative to the RSS satellite dataset which uses a climate model for the diurnal drift adjustment. Previous versions of this dataset used general circulation model output to remove the effects of drifting local measurement time on the measured temperatures. In this paper, we present a method to optimize these adjustments using information from the satellite measurements themselves. The new method finds a global-mean land diurnal cycle that peaks later in the afternoon, leading to improved agreement between measurements made by co-orbiting satellites. Those are just some of the problems which lead to such large version changes. Update: From a tweet from Carl Mears, here is a useful FAQ on the changes. "Note that all satellite data warm relative to radiosondes before about 2000, and then cool after about 2000. We don't know if this overall pattern is due to problems with the radiosonde data, with the satellite data or (most likely) both." In the Moyhu NCEP/NCAR index, the monthly reanalysis average fell from 0.40°C in May to 0.241°C in June, 2017. This makes it the coolest month for nearly two years - since 0.164°C in July 2015. Even so, it was still the third warmest in the record for that index, though I comment caution in compare values decades, because of lack of homogeneity. It was only just behind 2013 (0.249) for second place. It's the first time for nearly two years that a month fell behind an earlier corresponding month other than 2016. The main cool spot was Antarctica, and the main reason for the drop was that, as well, the Arctic dropped back to average, with Siberia mixed. Europe was warm. Temperature sounding microwave radiometers flown on polar-orbiting weather satellites provide a long-term, global-scale record of upper-atmosphere temperatures, beginning in late 1978 and continuing to the present. The focus of this paper is a lower-tropospheric temperature product constructed using measurements made by the Microwave Sounding Unit channel 2, and the Advanced Microwave Sounding Unit channel 5. The temperature weighting functions for these channels peak in the mid to upper troposphere. By using a weighted average of measurements made at different Earth incidence angles, the effective weighting function can be lowered so that it peaks in the lower troposphere. Previous versions of this dataset used general circulation model output to remove the effects of drifting local measurement time on the measured temperatures. In this paper, we present a method to optimize these adjustments using information from the satellite measurements themselves. The new method finds a global-mean land diurnal cycle that peaks later in the afternoon, leading to improved agreement between measurements made by co-orbiting satellites. The changes result in global-scale warming (global trend (70S-80N, 1979-2016) = °0.174 C/decade), ~30% larger than our previous version of the dataset (global trend, (70S-80N, 1979-2016) = 0.134C/decade). This change is primarily due to the changes in the adjustment for drifting local measurement time. 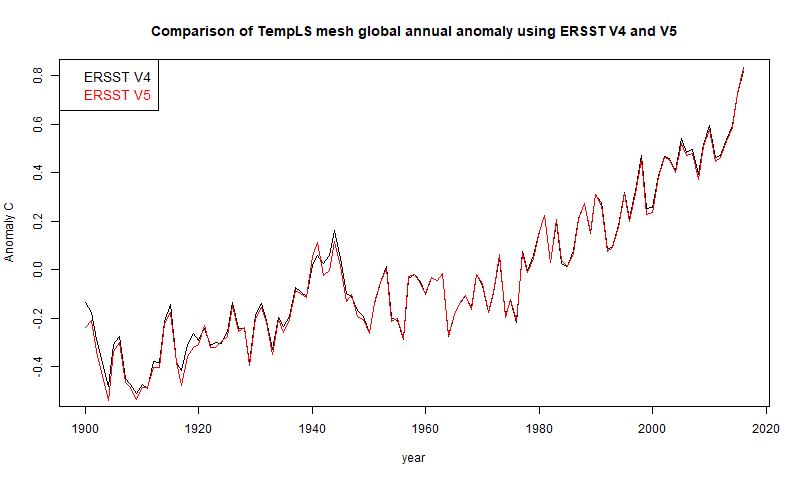 The new dataset shows more warming than most similar datasets constructed from satellites or radiosonde data. However, comparisons with total column water vapor over the oceans suggest that the new dataset may not show enough warming in the tropics. I have updated the data link in the source table.